Here all the free and low-cost resources that I have come across. If you know more then please let me know and I’ll post them on here. I want to be able to provide you with the freest and low-cost resources available. If you are aware of any new or updated resources that are not found here then please let me know about it so we can share with others! Thanks! We also want to let you know that PPI2PASS and Civil Engineering Academy have joined up to offer you a sweet discount. If you ever purchase a book from PPI2PASS you can use our exclusive code to get 15% off of any book you buy! Just use the code CEA15 and get 15% off of your order. Sweet! This works for individual books and not for packages or courses. Disclosure: I want to be completely upfront about the resources that are listed here. Most items listed are affiliate links that provide, at no cost to you, a small commission to me for helping you find products that will help you reach your goals of becoming a PE. We are an affiliate with PPI and we are a participant in the Amazon Services LLC Associates Program, an affiliate advertising program designed to provide a means for us to earn fees by linking to Amazon.com and affiliated sites. I work hard to find the best resources for you and I have experience with a lot of the items listed. Please do not spend money on obtaining these books and materials unless it helps you to achieve your goal. That said, let’s get to it! This blog is probably the absolute best resource detailing an engineers journey through the study process of the PE exam. She does a fabulous job outlining the thoughts going through her head and works and shares her entire schedule with problems she studied. It is a valuable free resource and I thank her for sharing it with the world. This is a great resource for the depth portion of the construction exam. There is plenty of free information on the site that includes downloads for each module of the test and a great forum for those taking the construction exam. If you are going to take the construction depth exam then I encourage you to purchase the construction practice exam that is there too. Perfect for chilling on a computer and watching video problems. They have tons of content for a low-cost $5 per month membership. Not a bad deal for what you get and they will for sure help you with the exam and getting more exposure to problems. A great blog that posts problems with solutions. It is a great resource if you are at a computer and don’t have your things with you. You can come here and review problems. It, of course, is good if you have your stuff with you too! 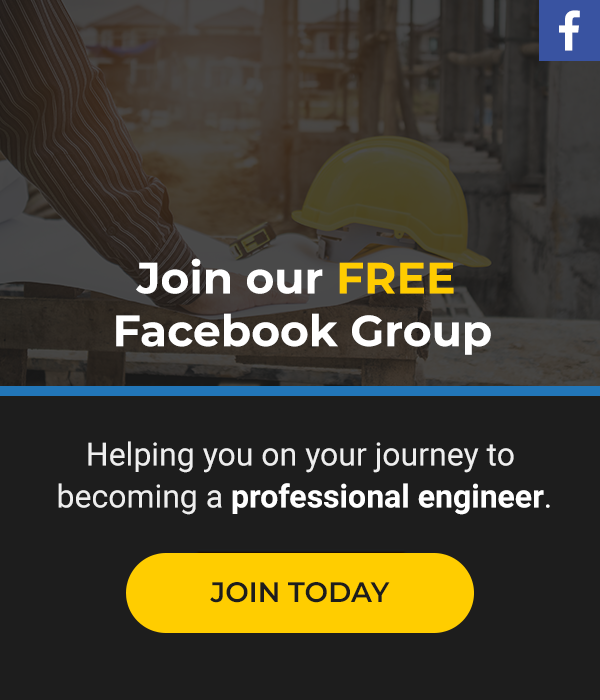 Click on the engineering portion of this site and you can gain access to a ton of free manuals that include: masonry, structures, soils, water, environmental, and more! If you click on the Doctrine and Training tab you will also see additional manuals. Here are some of my favorites: FM 5-434 Earthworking Operations, FM 5-426 Carpentry, FM 5-412 Project Management, FM5-472 Material Testing, TM 3-34.55 Construction Surveying, FM 5-410 Soils, TM 3-34.44 Concrete and Masonry. The UFC documents provide planning, design, construction, sustainment, restoration, and other criteria that apply to the Military Departments, the Defense Agencies, and the DoD Field Activities. Follow this link and scroll down to the 3-200 series for Civil Engineering. Here you will find a ton of free manuals to help you in a lot of subjects. Some of my favorites are: UFC 3-220-01 Geotechnical Engineering, UFC 3-220-07 Foundations, UFC 3-220-10N Soil Mechanics, UFC 3-220-01A Deep Foundations, UFC 3-230-03 Water Treatment, UFC 3-230-01 Water Storage, Distribution and Transmission. There are others so take a look around. If you are looking for help on a specific subject then MIT might be your answer. They offer free courses from their open courseware site with many lecture notes and material to download for free. For civil engineering, they offer Structural, Surveying, Construction Management, Geotechnical, and Transportation. I cannot tell you all the resources that are on YouTube. It's like a magical mirror that will tell you anything that you ask. If you look hard enough you can find any subject you are struggling with. Often times there are complete lectures by professors on here. You can also find the video practice problems that I have made to help you study as well. I would suggest starting there. If you are in a rush to get your books because you are late in the game with studying then you might want to check out the two following Amazon links to get your books in two days. If you are still a student, then check this out: Join Amazon Student FREE Two-Day Shipping for College Students. If not, then this works too: Join Amazon Prime – Watch Over 40,000 Movies & TV Shows Anytime – Start Free Trial Now. On to the books! Here’s the latest edition! The Civil Engineering Reference Manual provides a comprehensive review of all five NCEES Civil PE exam content areas: construction, geotechnical, structural, transportation, and water resources and environmental engineering. Over 750 example problems not only demonstrate how to apply important concepts and equations, they also include step-by-step solutions that show you the most efficient methods to use when solving exam problems. With more than 100 appendices from references and exam-adopted design standards, it’s possible to solve many exam problems using only the Civil EngineeringReference Manual. This is THE reference to have. This should be your bible for the next couple of months. In this new edition (15th) you will find the following updates to the material and topics. You’d most likely be fine with an older version of this book, but since the new 2015 NCEES specification has come out everyone is updating their material. Civil Breadth: Project Planning; Means and Methods; Soil Mechanics; Structural Mechanics; Hydraulics and Hydrology; Geometrics; Materials; Site Development. You also have your depth sections covered here as well including; construction, geotechnical, structural, transportation, and water resources and environmental. You will mark this up, tab it up, and make all kinds of notes for help on the exam. With every problem that you solve you should be turning to this for the equations to become familiar with it. There are a lot of chapters that you don’t use that are thrown in as a refresher, but overall there is nothing that compares to it. 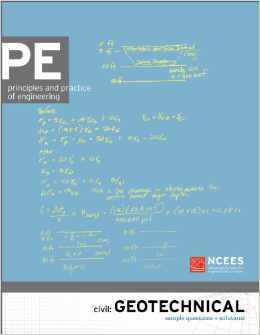 You could get by with an older version but the latest will include the newest codes, standards, and regulations on which the actual PE exam is based on so it is helpful to get the latest edition if you can. My Review of the book and why I like it! 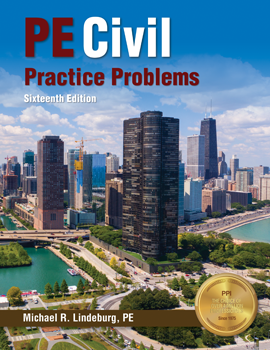 Practice Problems for the Civil Engineering PE Exam contains over 750 problems designed to help you identify important civil engineering topics and apply your knowledge to a variety of problems. Short, six-minute, multiple-choice problems demonstrate the format of the NCEES Civil PE exam and help you concentrate on a single subject. More complex problems combine several concepts, illustrate efficient and accurate solving methods, and familiarize you with the codes, standards, and references you’ll need for the exam. Solutions are clear, complete, and easy to follow. U.S. customary and SI units are equally supported, and units are meticulously identified and rigorously carried through all calculations. Where multiple methodologies (e.g., ASD and LRFD) are permitted by the exam, both solutions are presented in this book. Frequent references back to the Civil Engineering Reference Manual and the original codes and standards direct you to support material when you need it. The biggest complaint about these practice problems is that they are lengthy and challenging. Now, that’s not necessarily a bad thing, because you will become more prepared for the exam, but they definitely are not like the exam. Some questions say they are timed for 1 hour and are broken into parts. These are meant to test all aspects of a particular problem and you end up using multiple equations to solve them. I found that this was much more helpful for the depth section of the PE exam. You can hit your individual section and feel much better about passing when you get through this. This is the last PPI practice exam that seems to have been made and it matches up with the 15th edition of the CERM (it’ll work with the 16th and I’m betting newer editions too). It can be found on Amazon here. The exam itself comes with a 40 question breadth exam and the depth exam of your choosing. A common complaint is that this exam is a lot harder than the real exam, but I found it to be helpful despite that, especially for my depth section – which was geotech. Practice the problems even if you don’t know how to slog through them. It will help you and I still recommend it even though I can only seem to find it on Amazon at the moment. Ace the civil engineering PE exam on the first try! 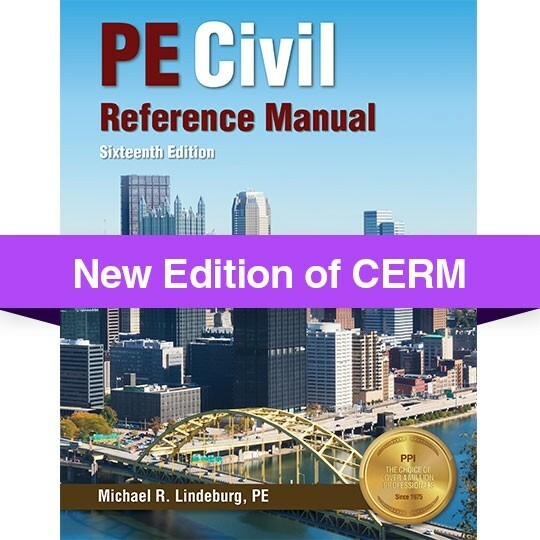 Fully revised for compliance with the new PE Civil syllabus, new specifications, and the latest design standards, Civil Engineering PE All-in-One Exam Guide, Third Edition, covers all the material included on the Principles and Practice of Civil Engineering (PE Civil) exam, given by the National Council of Examiners for Engineering and Surveying (NCEES). Featuring more than 200 pages of new material, this edition includes a new chapter on highway pavement design. This authoritative volume is presented in the Breadth and Depth format of the actual exam and contains equations, diagrams, exam preparation strategies, and more than 150 end-of-chapter practice questions with solutions. Designed to help you pass the exam with ease, this detailed, comprehensive resource also serves as an essential on-the-job reference. 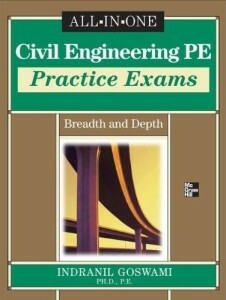 Presented in the Breadth and Depth format of the actual exam, this comprehensive guide is filled with hundreds of realistic practice questions based on the Principles and Practice of Civil Engineering (PE-CIVIL) exam, given by the National Council of Examiners for Engineering and Surveying (NCEES). Detailed solutions, including equations and diagrams, are provided for every question. 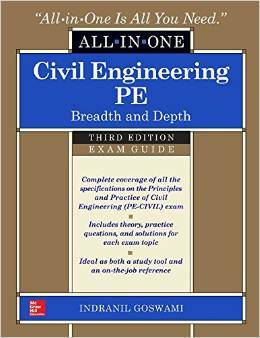 Civil Engineering PE Practice Exams offers intensive test preparation and is the perfect companion to Civil Engineering PE All-in-One Exam Guide. This book is a great reference and a great run at practice problems. I found them to be very helpful and more exam-like than most other exams. You will enjoy this book and you get a lot for the money. I highly recommend it! This exam includes 8 questions from each of the 5 civil engineering sub-disciplines tested during the morning session of the Civil PE Exam: Water Resources/Environmental, Geotechnical, Structural, Construction and Transportation. Civil Engineering Practice Examination #1 should be used as an assessment tool for the test-taker to evaluate his or her strengths and weaknesses within the field of civil engineering. 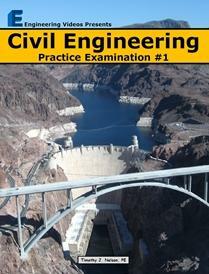 Civil Engineering Practice Examination #2 provides 40 multiple-choice civil engineering exam problems to help civil engineers prepare for their professional licensing examinations. This practice examination follows the specifications of the breadth examination (morning session), as defined by the National Council of Examiners for Engineering and Surveying (NCEES). This exam includes 8 questions from each of the 5 civil engineering sub-disciplines tested during the morning session of the Civil PE Exam: Water Resources/Environmental, Geotechnical, Structural, Construction, and Transportation. 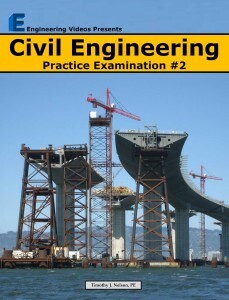 Civil Engineering Practice Examination #2 should be used as an assessment tool for the test-taker to evaluate his or her strengths and weaknesses within the field of civil engineering. 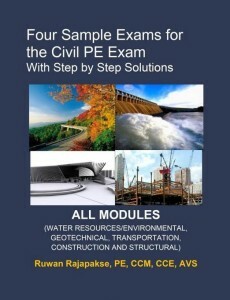 Four Sample Exams for The Civil PE Exam covers all five modules. Water Resources, Transportation, Geotechnical, Structural, and Construction. Many students who have the knowledge of these subjects sometimes fail due to lack of practice. This book will give the student much-needed practice. The book has provided detail solutions to all the problems. All solutions are provided with many illustrations and photographs. Each exam has 40 questions as in the real PE exam. The problems are similar to the problems found in the exam. This is the first edition of this book and it has recently been updated (as seen below). The second edition has updated the problems with new ones so you might just want both! 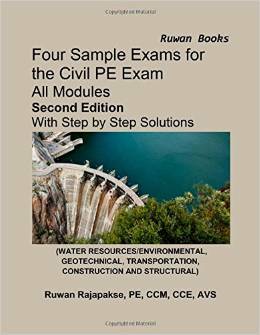 Four Sample Exams for The Civil PE Exam, second edition, covers all five modules just like the first edition but updated! Water Resources, Transportation, Geotechnical, Structural, and Construction. If this book is anything like the first edition I would tell anyone to buy it. I really enjoy the look and feel of these exams. Not only do they feel the same in terms of difficulty but they also go into in-depth in explaining each topic covered. I think you will really enjoy this book in your preparation for the PE exam. 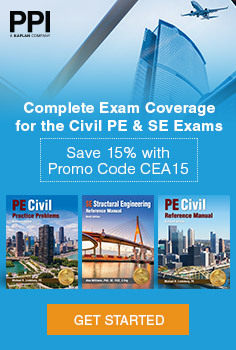 Designed to help you pass the Civil PE exam the first time! This morning session guide provides you with 40 realistic morning session exam problems with detailed solutions. Learn the study methods that have helped hundreds of EIT’s pass the test the first time through. Visit www.peexamguides.com for a free sample problem. Mike’s guide is a pretty good one. He outlines each step of the problem-solving process so that you can get a better understanding of just how you think about these things as you work them. The only downside is that there are only 40 problems. You’ll want to work more to feel really good about passing. Check it out though. 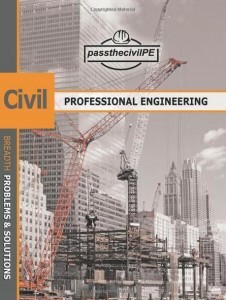 The Pass the Civil Professional Engineering (P.E.) 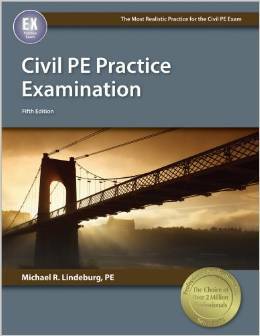 Exam Guide Book was developed because the practice is the essential component to passing the Civil Professional Engineering PE Exam. Training with materials similar in format, timing, language, and style will help to master the exam when it counts the most. The passthecivilPE Guide Book provides necessary information in the form of a combined practice exam and study guide that will deliver utmost confidence for the passing the Civil Professional Engineering PE Exam. This was recently updated to meet the new 2015 specification. 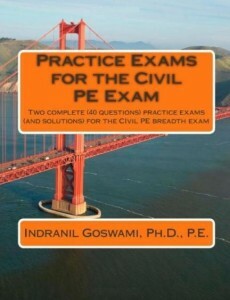 Two new Civil PE Practice Exams (40 questions + Solutions in each exam) created by Dr. Indranil Goswami. All of these questions are different from the breadth exams in the McGraw-Hill publication by the same author, which came out in 2012. Formatted in the same manner as the NCEES exams, and representing an appropriate level of difficulty, these practice exams can provide additional exam practice when preparing for the Civil PE Exam. We cannot end without talking about the NCEES exams. NCEES, who hosts and writes THE PE exam, writes up their own practice exams. I’ve shown here the geotechnical exam, but they offer one for each depth section. The test includes 40 questions for the breadth and 40 for the depth. These tests are going to be the MOST SIMILAR PE exam because they are written by the same people! The only problem is that you’ll probably want to work more. This is a great resource to test yourself a week or two ahead of the exam as that final examination of your skills. This is a must buy.